Recently, Warner Brothers announced plans to produce a new Dungeons & Dragons cinematic universe. For fans of the game, this sparked the hope that the film would be an improvement over 2000's ill-fated Jeremy Irons feature Dungeons & Dragons and its two low-budget, unscreened sequels. But old-school D&D fans will remember further back to the early 1980s, when the game's publisher TSR touted plans to release a D&D film penned by Academy Award winning screenwriter James Goldman, who famously wrote 1968's The Lion in Winter. Would this have been the movie D&D fans deserved? Or would it have been another cheesy box-office bomb? 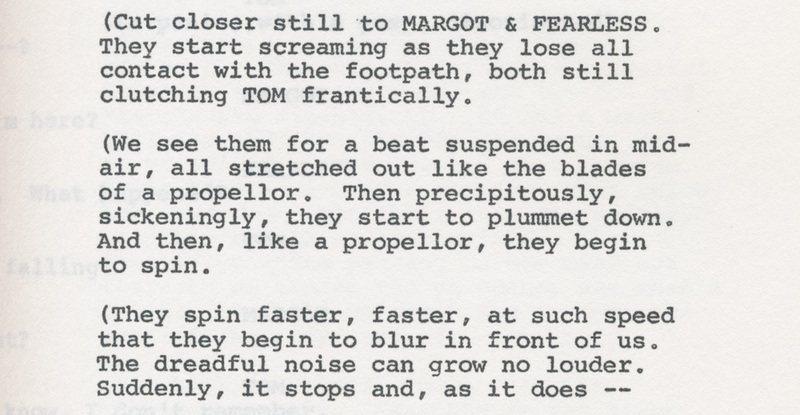 For three decades, the script has been shrouded in secrecy, though collectors recently recovered copies long held in the collection of TSR co-founder Brian Blume. But plans for a new D&D movie make this a perfect time to dust off a copy dated November 18, 1982 and finally open its pages to the world. First, let's set the stage a bit. Dungeons & Dragons became famous in the summer of 1979, after much sensational publicity about a kid supposedly getting lost playing the game in the steam tunnels below a Michigan university (never happened, by the way). As sales of the game skyrocketed over the next two years, film studios became interested in a D&D feature. 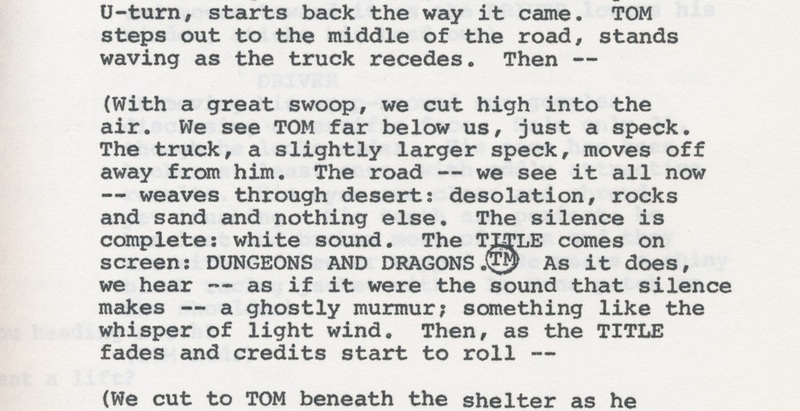 TSR spent much of 1981 in negotiations with 20th Century Fox, but broke off "because we did not believe that the studio would be willing to produce the sort of top-notch movie we must have," as TSR CEO and D&D co-author Gary Gygax wrote in September in TSR's company newsletter Random Events. In another contemporary interview in Polyhedron magazine, Gygax stresses that "we didn't want to end up with the rather disastrous type of movie that Tolkien's ring trilogy ended up with," referring to the early animated features. A D&D movie would need to be "based on the Dungeons & Dragons game-with imagination, and creativity, and excitement, and adventure, and not some sort of a Hollywood epic which takes the name and then perverts everything else." By March 1982, Gygax had secured James Goldman's involvement, and the interest of Goldman's wife Bobby as a potential producer. 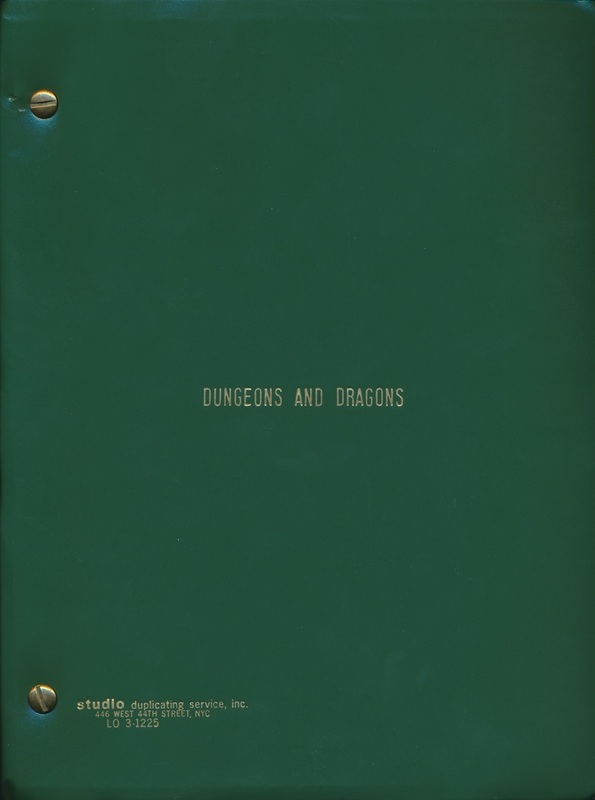 Work on the screenplay proceeded as TSR formed a new Entertainment and Media Division, and hunted for an executive to run it who would be, in Gygax's words, "responsible for the film project (after me, of course-ahem!)." Gygax spent three days with the Goldmans in the third week of September, working with them on the script. He worked cautiously, with "resolve to maintain as much control over the D&D movie as humanly possible." The recent release of the first Arnold Schwarzenegger film Conan the Barbarian gave Gygax an example of how not to make a fantasy film: he panned it in the pages of the Dragon magazine, adding "badly done films seem more likely to destroy interest in fantasy rather than build it." He was also surely aware that Mazes and Monsters, a sensational retelling of the steam tunnel kid story, would soon be released as a made-for-television movie - starring a hapless young Tom Hanks. "I promise all of you," Gygax wrote in the Dragon, "that if the D&D film isn't of the quality of Star Wars and Raiders of the Lost Ark, I will not only blast it... but I will apologize to you as well." He adds, "Give us a chance to prove that the genre can be good!" The story begins with Tom Boyman, a 23-year-old Californian who has finally saved up enough money to begin his studies at Yale. On his way to catch the bus east, he meets Milton "Fearless" Gilroy, a car racer who convinces him to go to a county fair before leaving. At the fair, Tom chances upon Margot Champion, a senior at Wellesley who is summering in California at an archaeological dig. The three of them strike up a friendship and visit the dig site that night, where, among howling winds, a mysterious power brings them all to another world. They awake near a strange body of water, where an oared galley awaits them. From this ship emerges Odo, a water-walking cleric, who bids them to come along. He then transfers the water-walking ability to the party, who join him on board to travel to the island of the Master. The Master explains that he, and this world, were created by the Onelord. Every seven hundred years, the power of the Master fades, and a Child will be found who is destined to replace the Master. However, because "nothing can exist without its opposite," the Onelord also created the Nightking, who is "dark beyond your powers to imagine," and whose strength grows as that of the Master fades. So a Chosen One is summoned from our world to help maintain the balance. The Master reveals that Tom is this Chosen One, and charges him with an urgent quest: the Child has been discovered, but has already been kidnapped by the Nightking, and can be saved only by Tom.